Roof Cleaning Saves You Money! Making your home more appealing to your friends, relatives, neighbors and prospective buyers because it will look like your home has a new roof. This will also help you sell the house faster. Making for a healthier lifestyle by removing bacteria from your environment that could make you sick. Adding years to the life to your tile or asphalt shingle roof. We do this by removing gloeocapsa magma from your roof. It is a species of bacteria fungus that feeds upon the limestone filler in asphalt shingle roofs and causes granule loss as it slowly dissolves your asphalt shingles or degrades your tile roof. Lowering electric bills by removing the heat absorbing dark bacteria fungus which makes your roof absorb and retain heat. We are more than a decade older and more experienced than any other roof cleaning company in the Houston Texas area. Younger roof cleaning companies are still experimenting and learning on your hard paid for roof while Katy Memorial Roof Cleaning & Power Washing is providing no pressure damage free roof cleaning services and offering an Exclusive 5 Year Warranty on roof cleaning. Katy Memorial Roof Cleaning & Power Washing removes this bacteria fungus from your roof with our damage free soft washing roof cleaning process. We have been roof cleaning in the greater Houston, Brookshire, Cypress, Fulshear, Katy, Kingsland, Missouri City, Richmond TX, Spring, Sugarland Texas and The Woodlands areas since 1994. We can provide you with roof cleaning, House, or Business exterior cleaning services that will make your roof, home or business look it's absolute best while saving you money and on most homes only costing several hundred dollars! That is cheap compared to the cost of a new roof. Remove Black Streaks and Roof Stains with a Roof Wash! 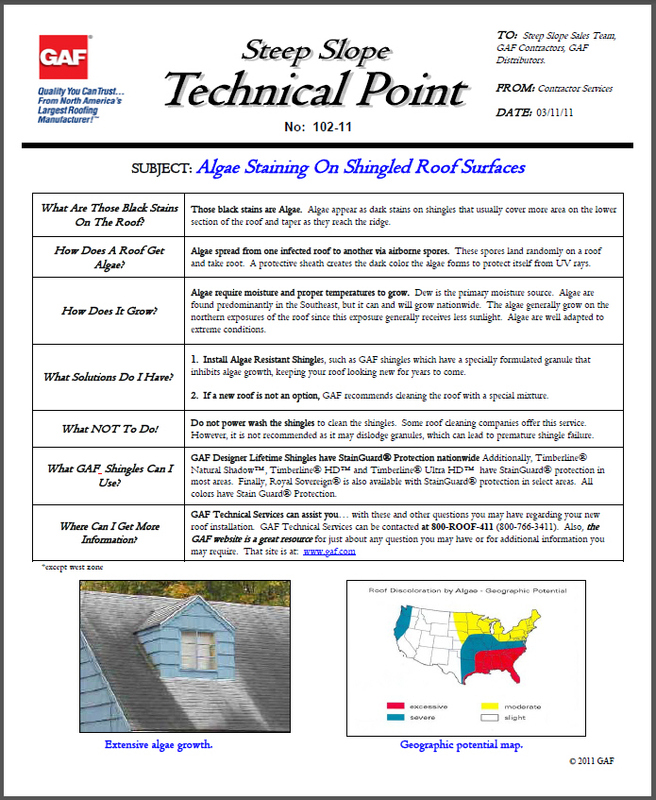 In the Southeastern United States and spreading throughout the Midwest a bacteria named gloeocapsa magma is leaving black streaks and stains on roofs. The bacteria accumulates over time as it feeds on the calcium carbonate produced by the morning dew and the limestone filler in composite shingles. This accumulation of bacteria appears on your roof as black streaks as the bacteria develops their dark and hard UV-protective outer coating. Experts within the subject area conclude the bacteria to be harmful, if left untreated. The growth holds moisture within shingles causing premature aging, rotting, and/or granule loss. Our roof cleaning process prevents this from happening to your hard earned roof. First we water any plants in the area under the roof line where the black streaks are that we will be cleaning. This allows the plants to absorb water and not roof cleaning solutions. Then we apply chlorine based roof cleaning solutions approved by the Asphalt Roofing Manufacturers Association (ARMA) with a 12 volt pump or air pump at no pressure that kills the bacteria fungus and makes it disappear immediately. At the same time we continue watering your plants to keep any roof cleaner over spray from damaging them. 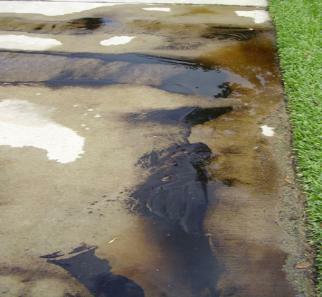 After roof cleaning we restitute your soils' pH and neutralize any roof cleaner run off. Katy Memorial Roof Cleaning does not use a pressure washer nor a harmful pitch witch in our roof cleaning procedure. Our Roof Stain Removal System leaves no yucky mold mildew removal sludge residue in your yard like a lot of our competitors do. That is the benefit of hiring a seasoned professional roof cleaner who uses the proper roof cleaning solutions and knows how to correctly clean your roof. Any company that is not applying chlorine based solutions approved by the Asphalt Roofing Manufacturers Association (ARMA) to clean your roof is not killing the spores of the bacteria that is growing on your roof. Therefore those companies set you up for a maintenance contract because it will need cleaning sooner. Repeat customers always get a discount instead! This is not a by product of Katy Memorial Roof Cleaning & Power Washing's roof cleaning process. That is the benefit of hiring a seasoned professional roof cleaner who uses the proper chlorine based roof cleaning solutions and knows how to correctly clean your roof and remove the black streaks while protecting your plants. GAF/ELK is one of America's oldest, most respected, and largest composition roofing manufacturers. What's Growing On Your Roof? The process of composite roof cleaning and tile roof cleaning differs. On neither roof do you ever clean with a pressure washer hooked up to a pitch witch. Pressure will destroy your roof. This will void your roof warranty and is not approved by (ARMA) Asphalt Roofing Manufacturers Association nor (RCIA) Roof Cleaners Instutite of America.